When I was living and working in Carlisle, I went through a Saint’s Phase, which probably felt something similar to what Vincent van Gogh felt when he went through his sunflower phase. All I wanted to do was paint and draw saints, and when I wasn’t doing that I was reading about them. In the end, I did various sketches of many saints, such as Cecilia and Alban, many of which went no further than the sketching stage. However, George, Mildred, Ursula, Cuthbert, Catherine of Siena and Catherine of Alexandria were completed and displayed in an exhibition. I requested various friends to pose as a particular saint, along with a few people sketched from magazine articles. 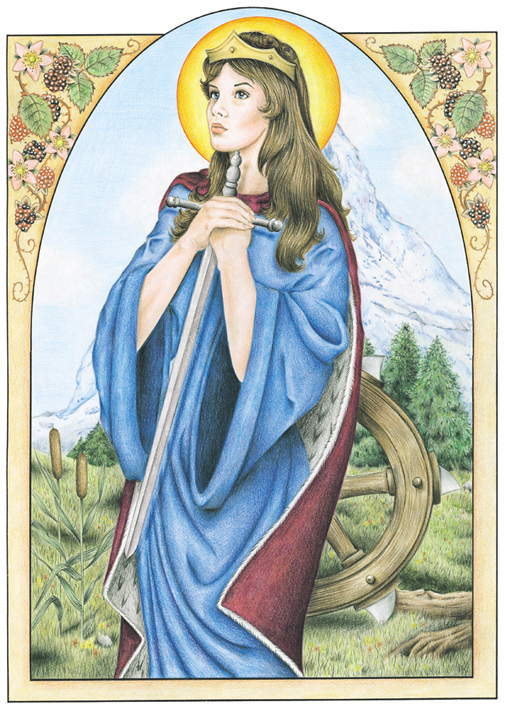 However, St. Catherine of Alexandria in this illustration was based upon some photographs I took of my friend, Susan Cartwright, nee Smith. According to the traditional narrative or legend, Catherine was the daughter of the governor of Alexandria, in Egypt, during the reign of the emperor Maximian (305–313). From a young age she had devoted herself to study. A vision of the Madonna and Child persuaded her to become a Christian. When the persecutions began under Maxentius, she went to the emperor and rebuked him for his cruelty. The emperor summoned fifty of the best pagan philosophers and orators to dispute with her, hoping that they would refute her pro-Christian arguments, but Catherine won the debate. Several of her adversaries, conquered by her eloquence, declared themselves Christians and were at once put to death. The story or legend goes on to say that Catherine was then scourged and imprisoned, during which time over 200 people came to see her, including Maxentius’ wife, Valeria Maximilla; all converted to Christianity and were subsequently martyred. Upon the failure of Maxentius to make Catherine yield by way of torture, he tried to win the beautiful and wise princess over by proposing marriage. The saint refused, declaring that her spouse was Jesus Christ, to whom she had consecrated her virginity. The furious emperor condemned Catherine to death on a wheel covered in spikes, but, at her touch, it shattered. Maxentius finally had her beheaded. An unhappy end, there’s no doubt about it, but her legend lives on still, with the Catherine Wheel being just one example of how her story captured the minds and imagination of the people that heard it.